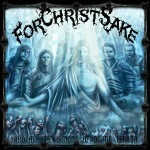 ForChristSake has been hard at work in the studio and they are nearing completion on the recording of their debut album “Apocalyptic Visions of Divine Terror”. The band is very happy to report they are recording 16 tracks of blistering Unblack Metal that is sure to shake the foundations of hell. The band is also very happy to reveal the final cover artwork that will embrace the cover of AVoDT. Roxx Records has set a release date of May 7, 2013. Preorder packages are now available. This explosive album will be offered in several different packages, including a special package that contains the last copies of the bands personal pressings of their debut self released EP ‘Death is but a Breath Away’.